The total number of data-points is about 255’000, collected at 5 minute interval, constantly, never paused, always. Doing some math : 255’000 / (5 * 60) = 850. So we do collect 850 data points per second, and these must be written to disk. A large NMS (a Zenoss Core instance) polling 250’000+ data points every 5 minutes (~ 845 RRD-updates per second). Might not be a high number at first sight, but think again: a normal, rotating disk has an access-time of 10-15 ms, and cannot parallelise writes. So a normal disk cannot do much more than 60-100 random writes per seconds, and this is when it is otherwise completely idle. So… we do have about 10 times more disk writes per second than what a single disk can do. Until recently, we spread the load on multiple local disks using RAID 0 (plus RAID 1 for redundancy). But we did read the limits as well, and the NMS started to have problems writing data to the filesystems, lending to all sorts of holes in graphs, missing events, etc. one obvious solution would be to limit the number of collected SNMP metrics. But we did that already, e.g. 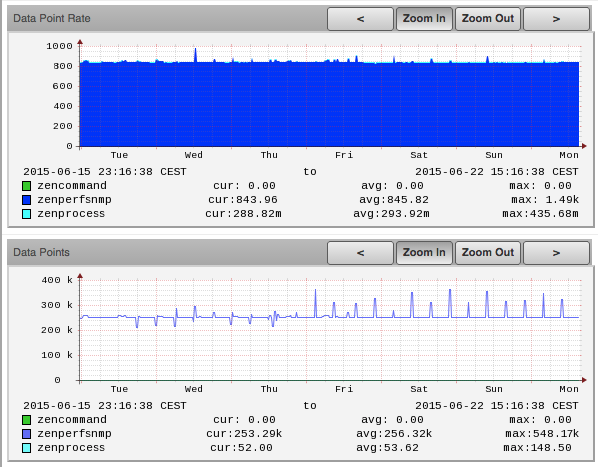 by stopping QoS monitoring, which by itself added 100’000+ metrics. Most NMS use RRD as storage for their metrics. This is known to be a problem when load increase, because having one file for one or few metrics is not particularly smart. I think a better way would be to use something like OpenTSDB or InfluxDB, but I haven’t got the proper experience, it’s more like a feeling that it would be more efficient. The problem is, there aren’t so many products using these time-serie databases yet. We identified as well one aggravating factor : long-running ESX snapshots where impacting the i/o performance a lot. So if you need snapshots, do not forget to delete them after a few days. How we solved the problem: when we moved the VM storage to local SSD’s, the problems went away immediately. CPU load went down, i/o where immediate, GUI was faster, no graph holes, everything is now much better. These two solutions are so slow than using SSD or disks will probably not provide any valuable difference. Conclusion is, only the best performing i/o subsystems will guaranty a performing NMS platform.